The world has changed enormously since The Edify School welcomed its first students in 2012, but its mission to attract and develop exceptional students and teachers from all backgrounds to serve a meritocratic society remains as vital now as it was then. At The Edify School we take our responsibility to find what is exceptional in students very seriously. The experience that we have prepared for them here gives every student an all-round education built on a foundation of Service, Adventure, Sports, Creative Arts and Academics. As a day school we also nurture a commitment to compassion, respect and well being that we believe is an antidote to the entitlement, anxiety and lack of connection that dominate the day-to-day lives of so many teenagers. Our experienced and dedicated teachers work and play with our students in the beautiful atmosphere and in the region around Mandsaur. To prepare boys to enter a competitive and interconnected world we build their capacity to collaborate, take intellectual risks and turn their ideas and passions into something original and valuable. We want them to leave The Edify School ready to engage with and contribute to any team they find themselves a member of; life is a team sport after all. For these years our students have achieved desired goals. With the support we would like to have an enviable reach into internships and workshops to help students to shape both aspiration and opportunity and moreover to get the real life experience. 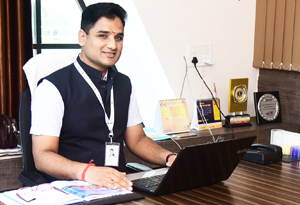 If you would like to know more about The Edify School or would like to arrange a visit to see what we do to transform students into educated citizens; inspire them to be just and ethical citizens; train them to be wise and principled leaders and prepare them to enter one of the strongest fraternities for life, then please visit our admissions page.